The following is a great article written by Ed Flosi. Ed’s a police sergeant in San Jose, California. He has been in law enforcement for over 25 years and is currently assigned as a supervisor in the Training Unit. Ed has a unique combination of academic background and practical real world experience including patrol, special operations and investigations. Ed is the current lead instructor for; (1) use-of-force training, and (2) defense and arrest tactics for the San Jose Police Department. 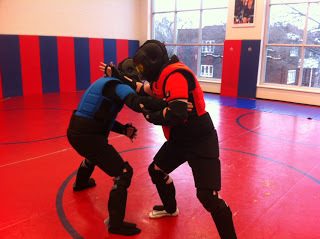 Impact suit training plays an important part in developing an officer’s abilities in and understanding of defensive tactics, known to many as close-quarters combat. Though DT/CQC training encompasses many aspects of potentially violent physical encounters, the time dedicated to impact weapon training can often be sterile and unrealistic. The ability to have a role player suit up in a protective suit and act out dynamic movements can break through the rote drills and deliver a multitude of benefits. For example, the student’s response to stress can be gauged depending on how aggressive the role player becomes. Also, the targets presented by the role player are much more realistic than a hand held baton shield. Overall, the impact suit was designed to protect the role player from blunt trauma injuries so that the training can be more realistic while lessening the chance of injury to both the student and role player. During the course of a career in police work, there is a high likelihood of an officer being involved in a knock-down, drag-out fight while attempting to take a suspect into custody. During this type of altercation, taking a “punch on the nose” is not unrealistic. It is a good idea for the trainee to discover the physical and emotional response to being punched in the face while still in a training environment. It is important to allow the trainee to experience this sensation, but only to the point that it is instructional and controlled. There is a vast difference between delivering a controlled strike to the student in order to allow him/her to experience it and pummeling a student simply because the role player can. I was privileged to have recently attended a course taught by members of the Salt Lake City Police Department regarding their response to several active shooter events (I highly recommend this course for all law enforcement). Among the many points they discussed, one that parallels our training objectives was the need to convince the students that the training scenario is real in their own minds. If the student believes the training scenario to be real, the brain will be “tricked” into thinking that the student has already “been theredone that” when the actual event happens. One of the advantages to impact suit training is the capability to assess the student’s ability to “switch on” the force when it is objectively reasonable to do so. Officers that use too little force or hesitate to use force when appropriate increase their risk of injury and sometimes end up using a more intrusive level of force to solve a now more dangerous or out of control situation. Just as important to assess this “switch on” ability, it is equally important to assess the student’s ability to “switch off” the force when the suspect has submitted. 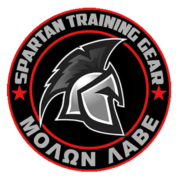 Are You Ready For The TACFIT Spartan Challenge? !